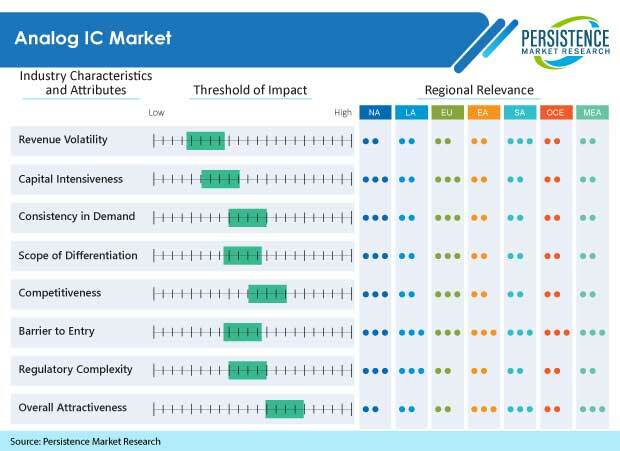 Persistence Market Research offers an eight-year forecast of the global analog IC market in a new report titled “Analog IC Market: Global Industry Analysis and Forecast, 2016-2024.” Persistence Market Research has used multiple resources of information and analysis to estimate the global analog IC market revenue. The research methodology to study this market is based on forecasts that focus on both global as well as regional trends in the economy, technology and population, along with company, product, country and demography specific trends. These trends are analyzed thoroughly and underlying factors are also identified. While examining this report, economic, technological, institutional, behavioral and competitive factors have been taken into consideration that may affect the global analog IC market. To understand the market, forecasting models have been developed in order to quantify the impact of each of these factors on industry spending. Analysts have created the forecast scenario for each causative factor and have also identified the contribution of each factor on a prospective basis. Apart from annual spending figures, the scenario of each application segment, respective consumer spending and country-wise adoption rates of analog ICs have also been taken into account while inspecting this market for the projected period of 2016-2024. In order to represent the impact of these figures on annual spending, annual averages are used rather than year-end totals while studying the global analog IC market. Figures are estimated in local currencies for each country and then converted to US dollars (US$) using the average 2016 exchange rate, which is held constant for each historical year and forecast year. This means the figures reflect industry trends, rather than being distorted by fluctuations in international exchange rates. While considering the product life cycle stages of the global analog IC market, the expert analysts have come up to a conclusion that historically, amplifiers and data converters have been the important quality of analog IC design, with designers specialized in continually improving those blocks for higher precision, higher performance, and better noise immunity. Presently analog IC design also involves the integration of multiple functions focusing towards specific applications. Low power and the more integrated signal chain is the requirement for most end user segments nowadays competing in this market. While estimating market size, Persistence Market Research has considered the product portfolio of the companies profiled, along with some other players. Economic fluctuations have not been considered while forecasting market numbers. Macroeconomic indicators such as GDP, wholesale and retail trade, merchandise trade and prices have been considered to arrive at the indicated market numbers. Yearly change in inflation rate has not been considered while forecasting market numbers. Top-down approach has been used to assess market numbers for each product category, while bottom-up approach has been used to counter-validate the reached numbers and end-use application-wise market numbers while studying this market. This research report provides a detailed analysis of the global analog IC market and offers insights on the various factors driving the popularity of these products and devices. The market study provides a comprehensive assessment of stakeholder strategies and imperatives for succeeding in the business. The report segregates the market based on mobile analytics solutions across different regions globally. The report includes analysis of key trends, drivers and restraints from the supply, demand and economy side, which are influencing the global analog IC market. Impact analysis of key growth drivers and restraints, based on the weighted average model is included in this report to facilitate clients with crystal clear decision-making insights. To calculate the global analog IC market size, the report considers country-wise consumer electronics production, country-wise automobile sales, consumer spending, adoption rates of automotive telematics devices and services across regions and revenue contribution of the top players. The forecast presented here assesses the total revenue by value across the market. In order to offer an accurate forecast, the report starts by sizing the current market, which forms the basis of how the global analog IC market will develop in the future. Given the characteristics of the market, the outcome is triangulated on the basis of different types of analyses based on the technology trends. Automotive application segment is expected to register relatively higher growth rates during the forecast period, due to developments in the field of automotive safety and driver information systems. In terms of revenue, the automotive application segment is estimated to register a CAGR of 7.7% during the forecast period. Several advanced automotive technologies that go beyond touchscreens, satellite radio, and voice-activated GPS commands are being continuously tested and improved, and are expected to be adopted in new car models, resulting in solid growth for the global analog IC market during the forecast period. Additionally, industrial, energy, and defense sectors are growing in terms of IC adoption in applications such as factory automation, solar energy, and electronic warfare systems. The projected strong CAGR for the automotive application segment is partly due to the fact that this segment is growing from a smaller base compared to the communications and consumer electronics segments and partly because a steady and significant increase in IC content is expected on board all new cars—luxury level to base models—throughout the forecast period. Automotive electronics is galvanizing the semiconductor industry, especially in developed economies such as the U.S., U.K., Australia, Norway, France, and Germany along with developing economies such as BRICS, with the introduction of next-generation cars equipped with electronic components, systems, and software to enhance car safety and management systems. This is driving adoption of advanced electronics in sophisticated engine and safety controls, navigation, audio/video systems, hybrid electric drives, and LED lighting. With this, the automotive electronics application segment in the analog IC market is expected to witness significant growth during the period of assessment. Increasing demand for driverless and smart cars is expected to generate the demand for advanced sensors over the forecast period, which is in turn driving growth of the automotive segment in the global analog IC market. Additionally, growing safety concerns and increasing government initiatives to encourage safety systems are further contributing to segment growth. Proliferation of semiconductor devices in automotive systems due to increased use of electronics for safety, navigation, fuel efficiency, emission reduction, and entertainment systems is strengthening demand in the automotive segment. In recent years, the Latin America region has emerged as a manufacturing and sales hub for automotive electronics, which is working as a catalyst for the growth of the analog IC market in the region. The automotive segment is expected to register high Y-o-Y growth rates throughout the forecast period and is expected to expand at a CAGR of 6.6% between 2016 and 2024 in Latin America. Brazil is one of the world’s largest markets for automobiles. The automotive segment in the country has been growing at a rapid pace over the last few years. In Europe, the automotive segment is expected to register high Y-o-Y growth rates throughout the forecast period and is expected to expand at a CAGR of 4.8% between 2016 and 2024. The automotive segment is anticipated to register high Y-o-Y growth rates throughout the forecast period in the APEJ analog IC market and is projected to expand at a CAGR of 10.1% between 2016 and 2024. In the MEA region, the automotive segment is likely to register high Y-o-Y growth rates throughout the forecast period and is predicted to expand at a CAGR of 7.8% between 2016 and 2024.